Lion & Griffin (Gryphon) Cookie/Cracker Jar Mark Query:- I have purchased a cookie jar which all of my collector books indicate "maker unknown". The jar has a base mark that contains the Staffordshire knot and I have searched and searched sites, including yours, trying to identify the mark but to no avail. I am attaching a jpeg of the mark and a jpeg in a different email of the jar itself. She is simply called "Lady in Pink Dress." Thank you in advance for your time and trouble. Sorry to take a while to answer - it's been rather rushed at my end. Thanks for your interesting query, I really appreciate the time and trouble you took to contact the site and share this fascinating image. Interesting and distinctly different mark - and VERY obscure, as your books attest to. It's not showing in any of my books either. However there are, of course, many Lion and Unicorns (British Royal Arms), many lions and lions, even a lion and a deer. There are also double griffins, and single Griffins etc etc. But there is not one example of a lion with a griffin anywhere. In fact when I checked various heraldry books I could not find any references at all of the lion with the griffin as a standard Heraldry device. You could try some research in this direction - the Griffin is associated with Yorkshire more than Stoke (Rockingham, for example, and others if my memory serves). My guess is the mark belongs to a small, short-lived company possibly Anglo-American. A small Staffordshire firm exporting specific wares to America via a retail customer or distributor perhaps. The griffin might have been added as a doff to the stateside client. If you'd like an expert opinion, you can use my 'Bring In The Specialists' page to contact a professional appraiser. You don't have to pay any money upfront to use this unique service, and I've designed it especially to protect my visitors from wasting time and money online. Sorry I can't help more. Keep me posted if you find any more information on your mystery mark. A.A. Importing is still in business and after speaking with them I found out they had imported many ceramic pieces from Japan back in the 1960's and early 1970's that were based on or copies of old German and Bavarian powder and dresser jars. This is one of those copies. The ink stamp on its base is the mark of the Japanese ceramic company (he believes the company's name was Nippon) that made the jar. However, the company is no longer in business, so I have no way of verifying this information nor does A.A. Importing have records that go back to the 1960's. Mark solved, eh? And it was never intended as a cookie jar, afterall. At least we can now remove it from the unknown maker pages of all the cookie jar books and place it under MIJ. There is another piece of info on this mark. The mark appears to have been inspired by the Staffordshire County Council armorial. The site www.civicheraldry.co.uk shows the arms very clearly. This armorial was obsoleted when several counties combined in the mid-'70s, and new arms granted. Peter (admin) says:- Nice one Terry! Thanks for your emails too. I see what you mean now. Yes, the Japanese companies in this era were known for making marks which impersonated English pottery marks. That's why it make this obsure one so difficult to pinpoint - and without the help of our visitors we may not have been able to do it. I make that we are better than Kovel's and Godden's combined!! Great resource, thanks to all those who contributed to this one. 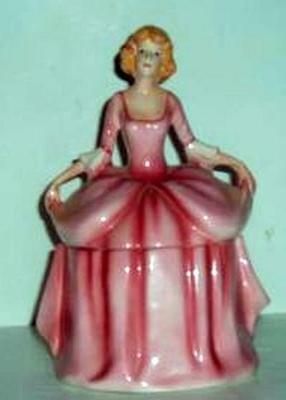 Further comment on "Lady in Pink Dress cookie jar"
Hi, I have two Toby jugs like pitchers or steins that also have the very same mark or crest on the bottom. I'm very pleased to see someone else with these markings. Now I too have somewhere to start. Thanks so much for sharing your (cookie jar) as I have had these mugs for 20 years. I got some info on the A A Importing company. Their website says they specialise in antique reproductions. Perhaps someone based in the US could call and ask about the country of origin. Is it Germany or Far East, or both? AA Importing is an American company that was founded in 1934 in St. Louis, MO as a distributor for kerosene lamp parts and accessories. Their "About Us' page on their website gives more details of how they got into importing reproductions. He was asking around to see if anyone knew dates. Chris says this mark is the Hachiya Brothers company from Japan. Clearly, their distributor may well have been AA Imports. Whether they worked together as one marketing company, who knows? If not it might be inaccurate to say the lion and griffin mark belongs to AA importing, because they may just have been the distributors for this Japanese firm and uses the goods of many suppliers. I have a "toby" style pitcher depicting a pirate that looks like Sinbad. On the bottom the word Sinbad is very lightly imprinted and the lion/griffin mark is also there. Thank you for posting all the prior info! I too have a Sinbad toby mug with this backstamp. Your informational has been extremely useful, as I may list mine on ebay. I want to be accurate. I aquired a rather large OWL Stein with the same mark discussed here. I have been familiar with most repro marks. 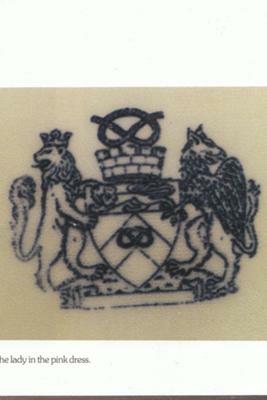 This I believe is a mark used by E. LIVERPOOL OHIO Co. Or one of the below listed companies who marked their pottery as such, to replicate the german made pottery with hopes to sell more American pottery. Backstamps on early American ware Until the late 19th century, most dinnerware in the United States of America was imported from Stoke-on-Trent, England. However, in the 1870s and 1880s, several American potters began to make white "granite ware." Several potteries were situated in New Jersey, including City Pottery in Trenton, other potteries were also established near East Liverpool, Ohio, including Knowles, Taylor & Knowles and Homer Laughlin & Co. Most of the ironstone produced in the U.S. had simpler shapes than the English imports which were still preferred by Americans. In an attempt to sell more of their wares, most American potteries did not mark their wares, and some used marks that resembled the British Royal Arms. worth a little more research I believe. Thank all of you . I just acquired a mermaid Toby . I could not even locate a pic of either Toby or back stamp. This conversation helped a great deal. I have also found a ceramic pitcher in the shape of a peg leg pirate. No name lion and griffon mark as well. Quite a nice 9in tall pitcher. No idea how to date it or who to attribute the piece to as a maker. Saw similar on Ebay but they did not know who made it either. Called it Majolica. Anything definitive yet? 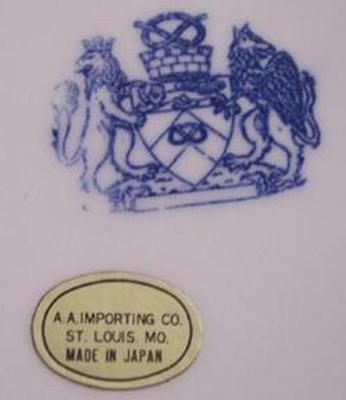 I don't understand the confusion because AA Importing already confirmed the mark belonged to a Japanese pottery company they did business with back in the 1960's. If you read my post way upstream I relate that I spoke personally on the telephone to AA Importing who confirmed this information. It's not AA Importing's stamp. It belongs to an Japanese pottery company. Which one? Will probably never know.